Twenty-eight days. That's how long members of the RCMP and Toronto police have been ordered to abstain from smoking or vaping recreational pot before reporting for duty. Calgary police officers won't be allowed to use cannabis at all while off the job. Such prohibitions have sparked a growing firestorm, with the national association representing front-line officers calling the policies "offensive" and the union for Toronto cops describing the ban as "ill-contrived" and "arbitrary." But is demanding that Mounties and municipal police officers forego a soon-to-be legal substance for such a lengthy period justified, when there's no similar policy governing alcohol or potentially mind-altering prescription medications? That depends on how much a person consumes and how often, said Dr. James MacKillop, co-director of the Centre for Medicinal Cannabis Research at McMaster University. 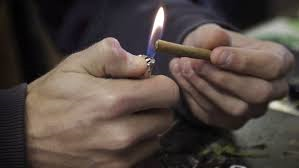 "So if you smoke today, within a few days it will be entirely out of your system because a single instance may be longer-lasting than alcohol but it still nonetheless will be metabolized and will be excreted," MacKillop said from Hamilton. "If a person is a regular, frequent user, then that window gets much longer because cannabis is what's called lipophilic, which means it's absorbed into the body's fat cells and then it leeches back out from the fat tissue into the bloodstream. And that's why it's also detectable in urine," he said. "So if a person's a heavy user, it may indeed be detectable for up to a month." MacKillop said a number of studies provide evidence of lingering effects of cannabis, including one that found reductions in cognitive performance in active pot users compared to non-users, which returned to normal levels with protracted abstinence. "It's not clear that any of those chronic effects on cognition persist after a person stops, but a 28-day washout period would be expected to eliminate virtually all of the cognitive consequences," he said. "That's a high bar, but optimal performance from the police or the military or airline pilots or other people in highly safety-sensitive jobs is very desirable. So it's hard for me to disagree with policies that prioritize safety." However, Rielle Capler, a researcher with the B.C. Centre On Substance Use, considers such lengthy periods of pre-work abstinence unreasonable based on how long the active psychoactive component of cannabis and breakdown products known as metabolites can affect the brain. "While the metabolites might still be present in the urine or blood that long, there is no connection to actual impairment," she said Friday from Vancouver. "Impairment with cannabis depends on the mode of use, how much you use and your tolerance," said Capler, who specializes in cannabis policy. "If you're inhaling it, the peak impairment is about one to two hours and the impairment dissipates after three to four hours. "If you're ingesting it, then you might start to feel impairment after an hour or two. It might peak at three or four hours, and be in your system for six to eight hours in terms of it having an effect," she added. "If you wanted to be super cautious and conservative, you could say no consumption eight hours before work." Capler maintains the police forces are creating a prohibition for a legal substance without the backing of scientific evidence, and that they should carefully examine the research literature on marijuana-induced impairment and revamp their policies based on the findings. Despite recreational cannabis being previously illegal, many Canadians have been toking or vaping the drug, she said. "And that's why we're changing the laws to coincide more with reality and not criminalize people for something that is happening. "We don't want anybody impaired on the job — that's very important, and I think that's always been important. "It doesn't become more important after Oct. 17."